"He's guaranteed to put some life in your afterlife." Beetlejuice is in the fantasy category because of its otherworldly plot about a couple who buy a house only to die shortly after. As ghosts they try to scare the new owners, a married couple and their teenage daughter, out of their home but after several failures they enlist the help of an insane ghoul named Beetlejuice who causes trouble and then is sent away. Knowing that the house is haunted, the new residents try to perform a séance. It is successful, they can now see the dead couple except now they are beginning to decay and disappear. 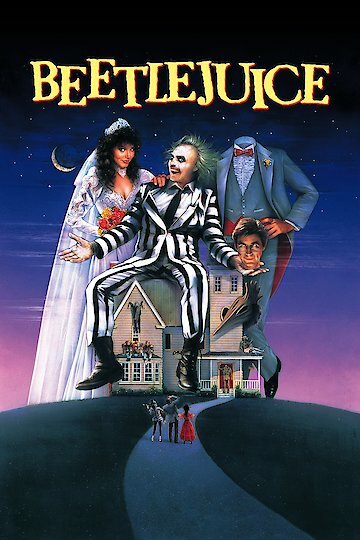 The living couple’s daughter asks Beetlejuice to help them but he will only agree if she will marry him. She agrees and the dead couple is saved; however now she has to marry him, and her parents are held hostage to ensure that she does so. Beetlejuice is currently available to watch and stream, download, buy on demand at Amazon Prime, Amazon, Vudu, FandangoNow, iTunes, YouTube VOD online. There's nothing crueler than a false rumor that Michael Keaton will soon be donning his striped Beetlejuice suit, but that's what the internet had to contend with this week.